As educators ourselves, we believe every student and athlete should have the chance to be the best version of themselves. That’s why we partner with schools to implement a unified approach to training, delivered through an easy to use online platform. Our customizable, research based fitness and performance programs, managed through our easy to use online platform, help you prepare your students and athletes for success on the field and in life. Our twelve professionally crafted fitness and performance programs help you train all your student athletes, from the novice 7th grader to the college bound athlete. Customized for your gym based on your equipment input, and editable by you, our programs work for any school, space, or weight room. We know you don’t need another complicated software system to try to master. That’s why we consulted with hundreds of coaches and teachers to build a streamlined, easy to use platform that lets you spend less time in the administrative weeds, and more time doing what you love: helping your student athletes get better! education and performance training at your school! Changing team culture is not an easy task. For David Hay, he had an even taller task—bringing together an entire athletic program. Here's how Glenwood High School reinvigorated their training and team culture. Athletic Director and Head Football Coach, Waylon Schenk, knew there had to be a more efficient way to train his athletes. Here's why he switched from BFS to PLT4M. 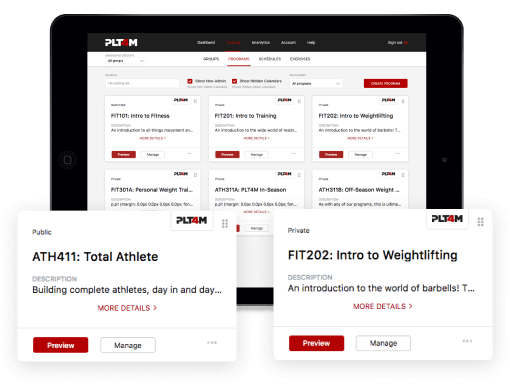 Schedule a 15-minute demo and learn how PLT4M can integrate technology and fitness education at your school!